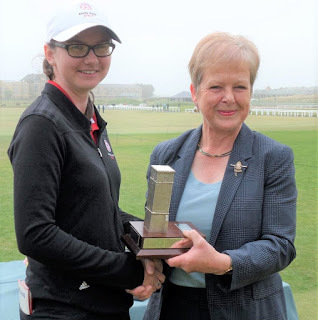 Despite a great effort from 19-year-old Hazel MacGarvie (Troon Ladies), Leicestershire's Lianna Bailey (Kirby Muxloe) today (Sunday) became the first English winner of the prestigious St Rule Trophy women's open amateur trophy at St Andrews since Mel Reid in 2007. It's the biggest win of Lianna's career so far. Bailey (21), pictured with St Rule Club captain Ros Rentoul by courtesy of Alma Robertson , had rounds of 71 and 73 over the New Course followed by a 70 at the Old Course for a 12-under-par total of 214 - one shot ahead of joint runners-up MacGarvie (67-76-72) and Emily Brennan (Trentham) 73-71-71. Bailey had an eagle 2 at the third on the Old Course - her third eagle of the tournament. Lianna had a sensational start to her third round: eagle at the second followed by birdies at the third, fourth, fifth, sixth and eighth: seven-under-par 31 to the turn! Hannah McCook (Grantown on Spey), recent winner of the Welsh and Irish women's open amateur stroke-play titles, looked well on the way to a notable hat-trick when she led with a pair of 71s over the New Course but her closing 74 at the Old for a 216 total was only good enough to see her tie for fourth place alongside Chloe Goadby (St Regulus). Caley McGinty (Knowle) from Bristol won the Lawson Trophy for the lowest aggregate by an Under-18 year old. She totalled 221, two shots ahead of compatriot Nicola Slater (Woodsome Hall). 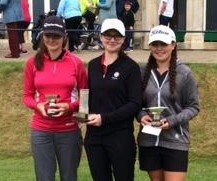 Scotland (428) did pip England (430) for the team title, thanks to good play by Connie Jaffrey, Goadby and McCook. Chloe Goadby had a bogey-free 69 (seven under par) over the Old Course. She birdied the second, third, fourth, fifth, sixth, 15th and 18th in halves of 33 and 36. There were only two other scores in the 60s at the Old Course today. Nicola Slater (Woodsome Hall) lurched from an 80 in her second round over the New Course to a 10-under-par 66 at the Old, equalling the record mark set by Germany's Denise Becker in 2007, and Dutch competitor Romy Meekers had a 67. 214 L Bailey (Kirby Muxloe) 71 73 70. 215 E Brennan (Trentham) 73 71 71, H MacGarvie (Troon Ladies) 67 76 72. 221 C McGinty (Knowle) 72 79 70, A Collis (Letchworth) 77 74 70, F Liddell (Ger) 73 73 75. 228 O Jackson (Pannal) 80 77 71, H Morgan (Hallamshire) 74 81 73, C Taylor (Nairn) 76 77 75, B Bayles (Bishop Auckland) 73 77 78, G Price (Bude and N Cornwall) 77 73 78. 233 M Wood (Woodsome Hall) 78 81 74, S Sexton (Lahinch) 76 82 75, C Walsh (Castlewarden) 78 80 77, M Giles (St Mellion) 77 79 77, T Bettle (Ger) 79 75 79. 235 K Beveridge (Aboyne) 77 79 79, S Wooster (Australia) 75 79 81. Retired: C Young (North Berwick) 78 81 ret, E Healey (W Lancs) 78 79 ret. 221 C McGinty. 224 N Slater. 225 E Lewis. 227 J Bailey. 228 B Bayles. 232 K Brodie. 428 Scotland (C Jaffrey, H McCook, C Goadby). 430 England (L Bailey, E Lewis, C Gainer). 447 Ireland (C Ryan, S Sexton, C Casey). 460 Germany, 471 USA.